For a tennis player chronic elbow pain is often a difficult problem. Lateral epicondylitis or tennis elbow is a frequent cause of chronic elbow pain in tennis players. 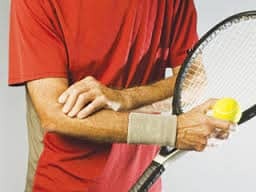 Tennis elbow often fails to respond to rest, medications, physical therapy, and even surgery. Platelet Rich Plasma (PRP) has been used to treat tennis elbow or lateral epicondylitis with success. An tennis player who failed to respond to conservative measures for tennis elbow, was treated with Platelet Rich Plasma (PRP). Only one treatment was needed and with a short rest interval, was able to resume complete tennis play in 2 weeks. Platelet Rich Plasma (PRP) may be considered an alternative treatment for tennis elbow and recalcitrant injuries. Other elbow disorders including golfers elbow (medial epicondylitis), bursitis, and tendinopathies have been treated with PRP. As with most athletic and sports injuries, getting back into the game in top form is important. Regenerative Medicine therapies such as Platelet Rich Plasma (PRP) may help in some circumstances. Consultation with Dennis M. Lox, MD, may assist in developing a Regenerative Medicine strategy. Many athletes have been aided to return to their game by Dr. Lox and regenerative type therapies. Tennis elbow is just one of many diverse injuries that may respond to Platelet Rich Plasma (PRP).